Whispers in the Loggia: Amid Vatican Storm, Pope Calls His "Senate" to "A Service of Love"
Amid Vatican Storm, Pope Calls His "Senate" to "A Service of Love"
With the usual flash of color that invariably makes it one of the Vatican's most vivid days, this morning brought the creation of 22 new cardinals in a consistory whose freshly-revised script saw the rite unfold at a record pace, wrapping up in roughly an hour and a half despite the inclusion of several new elements. 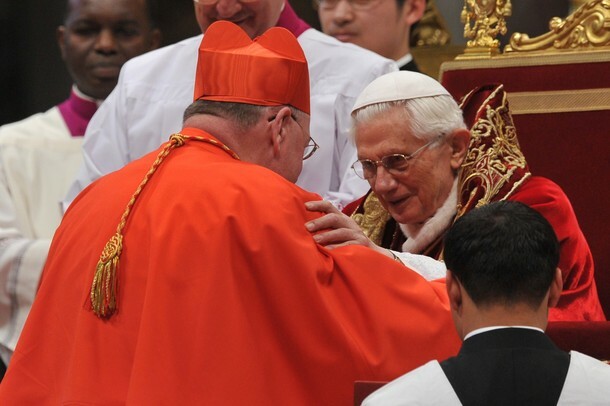 Held inside St Peter's Basilica for the third time in the reign of Benedict XVI, the new intake formally raises the number of cardinals eligible to elect a Pope to 125, its largest complement in a decade. At least 13 voting seats in the papal "Senate" will open over the next year as cardinals age out of their conclave rights on reaching their 80th birthdays. With today's group, the German pontiff has now chosen a majority of the voters who will, in time, choose his successor. Yet for all the customary pomp and energy of the moment, this consistory -- highlighted by the ascent of New York's Cardinal Timothy Dolan (above) -- takes place against the backdrop of an unusually rattled Vatican amid the recent outbreak of damaging leaks to the Italian press over the last month. Marked by constantly shifting developments, the ongoing tempest has centered around the publication of confidential internal documents which have alleged everything from "corruption" and mismanagement in the governance of the city-state to warnings of a "death plot" against Benedict himself. The strange, roiled scene provides the context of the Pope's allocutio, or homily to the new cardinals, which traditionally serves as an explanation to them of their new responsibilities. Fullvideo of the consistory is available on-demand via the Vatican's HD player, and below is an English translation of B16's remarks. With these words the entrance hymn has led us into the solemn and evocative ritual of the ordinary public Consistory for the creation of new Cardinals, with the placing of the biretta, the handing over of the ring and the assigning of a titular church. They are the efficacious words with which Jesus constituted Peter as the solid foundation of the Church. On such a foundation the faith represents the qualitative factor: Simon becomes Peter – the Rock – in as much as he professed his faith in Jesus as Messiah and Son of God. In the proclamation of Christ the Church is bound to Peter and Peter is placed in the Church as a rock; although it is Christ himself who builds up the Church, Peter must always be a constitutive element of that upbuilding. He will always be such through faithfulness to his confession made at Caesarea Philippi, in virtue of the affirmation, "You are the Christ, the Son of the living God". In the Gospel we have just heard proclaimed there is offered a model to imitate and to follow. Against the background of the third prediction of the Passion, death and resurrection of the Son of Man, and in profound contrast to it, is placed the scene of the two sons of Zebedee, James and John, who are still pursuing dreams of glory beside Jesus. They ask him, "Grant us to sit, one at your right hand and one at your left, in your glory" (Mk 10:37). The response of Jesus is striking, and he asks an unexpected question: "You do not know what you are asking. Are you able to drink the cup that I drink?" (Mk 10:38). The allusion is crystal clear: the chalice is that of the Passion, which Jesus accepts as the will of God. Serving God and others, self-giving: this is the logic which authentic faith imparts and develops in our daily lives and which is not the type of power and glory which belongs to this world. By their request, James and John demonstrate that they do not understand the logic of the life to which Jesus witnesses, that logic which – according to the Master – must characterize the disciple in his spirit and in his actions. The erroneous logic is not the sole preserve of the two sons of Zebedee because, as the evangelist narrates, it also spreads to "the other ten" apostles who "began to be indignant at James and John" (Mk 10:41). They were indignant, because it is not easy to enter into the logic of the Gospel and to let go of power and glory. Saint John Chrysostom affirms that all of the apostles were imperfect, whether it was the two who wished to lift themselves above the other ten, or whether it was the ten who were jealous of them ("Commentary on Matthew", 65, 4: PG 58, 619-622). Commenting on the parallel passages in the Gospel of Luke, Saint Cyril of Alexandria adds, "The disciples had fallen into human weakness and were discussing among themselves which one would be the leader and superior to the others… This happened and is recounted for our advantage… What happened to the holy Apostles can be understood by us as an incentive to humility" ("Commentary on Luke", 12, 5, 24: PG 72, 912). This episode gives Jesus a way to address each of the disciples and "to call them to himself", almost to pull them in, to form them into one indivisible body with him, and to indicate which is the path to real glory, that of God: "You know that those who are supposed to rule over the Gentiles lord it over them, and their great men exercise authority over them. But it shall not be so among you; but whoever would be great among you must be your servant, and whoever would be first among you must be slave of all" (Mk 10:42-44). Dominion and service, egoism and altruism, possession and gift, self-interest and gratuitousness: these profoundly contrasting approaches confront each other in every age and place. There is no doubt about the path chosen by Jesus: he does not merely indicate it with words to the disciples of then and of today, but he lives it in his own flesh. He explains, in fact, "For the Son of man also came not to be served but to serve, and to give his life as a ransom for many" (Mk 10:45). These words shed light upon today’s public Consistory with a particular intensity. They resound in the depths of the soul and represent an invitation and a reminder, a commission and an encouragement especially for you, dear and venerable Brothers who are about to be enrolled in the College of Cardinals. According to biblical tradition, the Son of man is the one who receives power and dominion from God (cf. Dan 7:13f). Jesus interprets his mission on earth by combining the figure of the Son of man with that of the suffering Servant, described in Isaiah (cf. 53:1-12). He receives power and the glory only inasmuch as he is "servant"; but he is servant inasmuch as he welcomes within himself the fate of the suffering and the sin of all humanity. His service is realized in total faithfulness and complete responsibility towards mankind. In this way the free acceptance of his violent death becomes the price of freedom for many, it becomes the beginning and the foundation of the redemption of each person and of the entire human race. Dear Brothers who are to be enrolled in the College of Cardinals, may Christ’s total gift of self on the Cross be for you the foundation, stimulus and strength of a faith operative in charity. May your mission in the Church and the world always be "in Christ" alone, responding to his logic and not that of the world, and may it be illumined by faith and animated by charity which comes to us from the glorious Cross of the Lord. On the ring which I will soon place on your finger, are represented Saints Peter and Paul, and in the middle a star which evokes the Mother of God. Wearing this ring, you are reminded each day to remember the witness which these two Apostles gave to Christ even unto martyrdom here in Rome, their blood making the Church fruitful. The example of the Virgin Mother will always be for you an invitation to follow her who was strong in faith and a humble servant of the Lord. "Even To the Shedding of Your Blood...."